Searching for the way to print screen on Mac device? Then you are at right page with good information. When you pick any ordinary laptop or pc, then you can see a dedicated key to take a screenshot of the screen. The key is tilted as PrtSc. But if you are using a Mac book, then you can’t see this option on your keyboard. But for a Mac, you will get more option to print screen mac. But the question is how to print screen on mac with this option. Why this question arises because, on a Mac, you can use multiple keys to capture the screen, one key for PrtSc is always a good option, but Mac provides you with smart options with five different methods. And all of them are given below. But before we proceed to the methods, first take note of some important points. Recommended: iMessage Waiting for Activation – How to Fix the Issue on iPhone or iPad? 1.1 How Do You Print Screen On A Mac? Screenshots are to the desktop folder with capturing date and time. The format is .PNG from Mac OS X 10.6 and above. From some of the apps, one can’t take a screenshot like a DVD player. The user can open and save screenshots with apps like Preview and Safari. How Do You Print Screen On A Mac? Most of the time we need the screenshot of full screen. The reason may be different like transaction, or messages, or other information but our concern is to capture full screen. The task is simple to accomplish as it needs a combination of three keys from your Mac keyboard. Step #1: Look for command, shift and number 3 key and press them together. Step #2: As you will press all of them together, it will capture the full screen. Step #3: It will save on the desktop with the title Screen Shot with date and time. 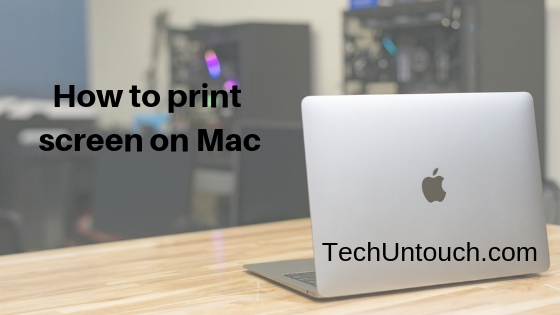 If you want to capture an only specific part of the screen due to some confidential information or don’t want to reveal the other option of the screen to others, then you can print screen MacBook in the same manner as well. For this method again you need the combination of three keys, but undoubtedly the combination is different. Step #1: From the Mac keyboard, press Command, Shift and number 4 key together. Step #2: As you press all these keys together, you can capture the needed part of the screen. Step #3: For this, you can see the cursor changed to a Print Screen icon. Click on it and drag the cursor to choose the specific section of the screen. Step #4: Once you do it, it will automatic captured and save on the desktop. Sometimes it happens that we need to capture a whole single window. In such case, Mac has an option for this too. To capture the whole window, first, go to that window as it needed your window active and open. Once you do it, follow the given steps. Step #1: Here you need a combination of three keys Command, Shift and number 4. Step #2: Press all three keys together, and your cursor changes to a cross-hair Print Screen icon. Step #3: From Mac keyboard, press spacebar Key and cursor change to a camera icon. Step #4: Point on it and click on the icon on the active window to capture it. Step #5: And it will save on your desktop with date and time of capture. If you want to print screen on mac with the menu, then the steps are here. Step #1: Go to the menu which you likely to capture as a PrtSc. Step #2: Now look for the three keys in combination to press together. Here you have to press Command, Shift and number 4 key. Step #3: As you press these three keys together, your cursor will turn into cross-hair icon. Step #4: Now, press spacebar key and cursor will change from cross-hair icon to camera icon. Step #5: Move the icon and capture the menu. Step #6: When you move the cursor, you can see a menu is highlighted, now capture it by a single click of a mouse. And it will capture the whole menu and save it on the desktop. For capturing touch bar, you need the MacBook Pro with macOS Sierra 10.12.2 or later. If it fulfills then go to the steps to know how to print screen on a Mac. Step #1: Press the shift key, command key, and number 6 key together from the keyboard. Step #2: As you press it in the same manner, it will capture the touch bar. Step #3: Here, you can customize the Touch Bar’s Control Strip region and add a Screenshot option. By this way, you can set a shortcut, take the screenshot, change the location and change screenshot type to save it. So it is all about how to print screen on Mac. We hope this guide is helpful to you to take the screenshot of your desired on Mac quickly. In case if you have any problem, you can ask us freely 14*7 using the comment section below. Thank you! How to Get iMessage for Android Phone?